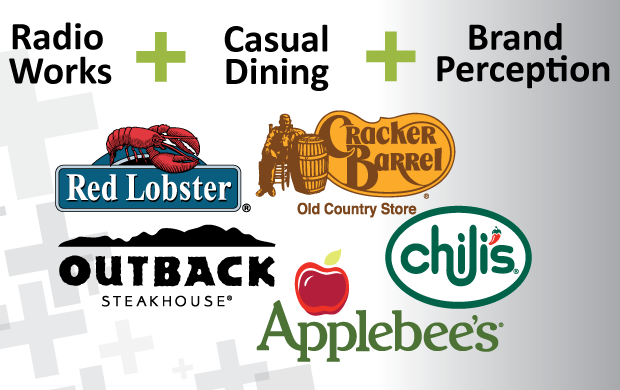 A popular American casual dining chain, known for their country style meals, was introducing new, healthier menu items. Their goal was to encourage potential customers to think differently about the restaurant and increase their consideration for eating there. In the summer of 2012, the restaurant launched a radio campaign in 100 of their key markets. For one month, the restaurant used radio exclusively (at 150 GRPs/week). The creative emphasized the new menu items. Katz Marketing Solutions commissioned Ipsos MediaCT to conduct online interviews with 900 casual dining patrons (who reside in the same geographic footprint as the radio campaign) at the conclusion of the campaign. Data comparisons are based on patrons exposed to the radio campaign vs. patrons who were not.